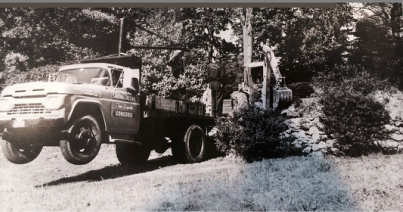 Since 1986 the name Greeno has been associated with large tree relocation throughout New England. We were one of the first companies to operate a large tree spade in the area. Our professional approach and expertise has earned us a solid reputation in large tree handling. Not only do we specialize in large and small tree transplanting, but we also offer our customers creative ideas and suggestions to maximize the full potential of their landscaping project. In addition to providing a new tree or moving an existing one, we also offer our clients the option to sell their trees. This provides the home owner with a cost effective, plus eco-friendly plan rather than cutting the tree down. We help create the vision imagined by designers, architects, businesses and private individuals, by blocking out unsightly views or enhancing the established landscape. We have the capabilities with our tree spades to relocate and transplant some species of trees up to 50 ft high and with up to a 13" caliper trunk. 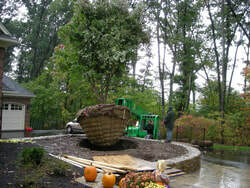 For larger trees or more challenging locations we offer air spading or hand dug tree transplanting. We work throughout the year to provide our customers with the best approach towards their situation. Our clients are not only limited to home owners. We have worked hand in hand with commercial contractors, movie producers, golf courses, hospitals, hotel management, airports and numerous government agencies. We are fully insured and our professional, experienced crew will ensure that you and your property will be treated with the utmost care and respect. We stand behind our work, and the excellent success rate with our transplanted trees shows that we care. We also offer our customers an aftercare program along with written instructions on how to properly care for their newly transplanted trees. We will occasionally stop in to evaluate the progress of our past projects.